Guardian Exhibition & Display is located on the thriving and aptly named Progress Road in Leigh-On-Sea, Essex - just a forty minute drive from our "home" exhibition centre London ExCel. There are no exhibition and conference centres we haven’t been to, and many of them are only a short drive away from our facility. Our prime location also provides us with the ability to visit our clients and provide product demonstrations at their offices free of charge. So what are you waiting for? 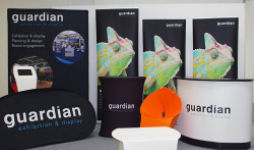 Fill in the contact form below and we’ll be in touch as soon as possible to discuss your exhibition plans or answer any queries you have about any of our products or services. Alternatively, give us a call on 01702 662111 or pop in and see us at our showroom.